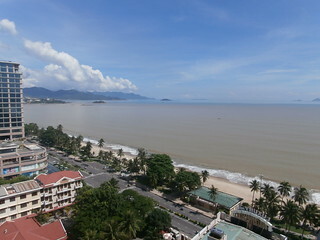 I guess Nha Trang is kind of like Vietnam’s answer to the Gold Coast. Lots of highrise hotels along the beach front with many more under construction. The city is far slower than Hanoi with much less traffic and possibly even a slightly higher regard for road rules (if there are any in this country).We decided to go for a walk and explore on our first day here but only lasted about an hour before retreating back to the pool on the 6th floor of our hotel. The heat is intense here and from observation we’ve learnt that even the locals stay indoors between about 11am and 2pm. Thankfully, indoors is pretty comfortable at the Sheraton and our bed isn’t made of concrete. Guys, you should take the cable car ride to Vinpearal theme park.Its an fantastic view of the harbour and looks back along the beach front where your hotel is. The water slides are good fun as well.